This page provides descriptions of all 26 oral presentations by student teams at the 2017 SSEP National Conference. Abstract: We investigated whether the susceptibility of Escherichia coli bacteria to ampicillin antibiotic is influenced by differing gravity conditions. Parallel E. coli populations were kept dormant in saline on Earth and in Space until D-5. At this point, a clamp was released to allow the populations to grow in nutrient broth until D-2, when they were exposed to ampicillin. There was no significant difference in the amount of E. coli that survived ampicillin exposure in microgravity compared to Earth gravity. Abstract: This experiment was designed to test the Raphanus Sativus seed germination in microgravity compared to the ground truth. 8 seeds in rockwool soil were activated in willow water and raw honey on A=0 in microgravity. The experiment was terminated at U-2 by a formaldehyde solution. The analysis included quantifying the number of seeds germinated. We concluded that seed germination is possible in microgravity and the number of seeds germinated in microgravity were similar to the ground truth. Abstract: The enzyme Matrix Metalloproteinase-1 (MMP-1) underlies astronauts’ health detriments by lysing collagen. Collagen fibrils are less damaged by proteolysis when strained by physical force acting on fibril networks; we hypothesize absence of gravitational force renders a given MMP-1 amount more destructive. Phosphate-buffered Gelfoam® samples with and without MMP-1 constituted microgravity experiments; this, quadruplicated, constituted ground experiments. Electrophoresis indicated no difference between environments in cleavage of collagen’s primary structure. The Gelfoam® model was inconclusive regarding the hypothesised effect on fibrillar structure. Abstract: The experiment was designed to observe the impact of microgravity on the effectiveness of polymer beads when cleaning an oil-stained cloth. On Earth, polymer beads require a minimal amount of water to be activated, expanding to trap stains. Analysis included imaging with a microscope, color wheel, black light and measuring mass. Our conclusion showed, on three of the four measures, that microgravity had no impact on the effectiveness of polymer beads when compared with the ground truth. Abstract: This experiment measured formation of a biofilm by the bacteria Staphylococcus epidermidis on a catheter in microgravity compared to the ground truth. On U-14 freeze dried bacteria was activated with a growth media. On U-5 the growth inhibitor was introduced. The biofilm that had formed in the FME and on the catheter was harvested. A spectrophotometer was used to determine the relative bacteria counts. Our results showed that there was less biofilm formation in microgravity compared to the ground truth. Abstract: This experiment was designed to investigate the effects of microgravity on the growth of Quinoa seeds. Organic seeds were placed in a growing mat in one half of the test tube while sterilized water was placed in the other. Analysis included number of seeds germinated, length of seedling roots, and dried biomass of seedlings. It was determined seedling root lengths were greater in microgravity but overall biomass was greater on Earth with equal ability to grow in either location. Abstract: This experiment was designed to monitor lactic acid production of Streptococcus mutans in microgravity compared to the ground truth. Freeze-dried bacteria was activated with growth media on D-5. D-2 clamp B was opened containing the growth inhibitor. Analysis included a Lactic Acid Assay, Mass Pellet Test, Optical Density Test and gram staining microscopy. Our conclusion did not show a significant change in growth rate. However, there was a significant increase in the production of lactic acid in microgravity compared to the ground truth. Abstract: This presentation is about the effects of micro gravity on blue green algae. In this experiment we found many differences between the algae that went to space and the algae that stayed on earth. Our presentation will include our purpose, procedure, data, and conclusions. Abstract: The aim of this experiment is to determine the effect of microgravity on adolescent pig muscle tissue regeneration with Tissue Regeneration Factor at 150 mg (TRF-150). Glucose levels, Protein levels, Dissolved Oxygen levels, pH levels, and SEM images of the control/Earth and experimental/I.S.S. samples were analyzed to quantify muscle tissue regeneration and compared to determine the effect of microgravity. The results, while inconclusive, support our hypothesis that microgravity enhances the effectiveness of TRF-150 during tissue regeneration. Abstract: This experiment was designed to monitor the growth of Ryegrass seeds in microgravity compared to the Earth ground truth. Ryegrass seed embedded in gauze growth chamber started the germination process by the release of water at U-14. A Salt-fixative stopped the growth five days before the seeds returned to Earth. Analysis showed that the seeds in microgravity had longer roots but the germination rate was much lower than grown on Earth. Abstract: This experiment was designed to monitor the effect of Microgravity on an Upstate Abundance strand of Solanum tuberosum. 12 half inch diameter seed potatoes were sent to the ISS. Two control groups included one ground in a tube (11 potatoes) and 6 ground non-tube potatoes. Analysis included starch assay, photosynthesis test, height comparison, and chromosomal DNA comparison. Our conclusion found differences in growth were probably due to the experimental tube, not space travel. At the very least, the sample size was not enough to definitively conclude. Title: How Does Spaceflight Affect the Detachment of Zinc Whiskers on Raised Access Server Room Floor Tile? Abstract: Zinc whiskers are hair-like protrusions that may form on zinc-galvanized or zinc-electroplated surfaces. If whiskers become airborne, they can land on and bridge electronic components, causing catastrophic electronic failures. This study focused on the detachment rate of zinc whiskers on a floor tile sample through its SSEP flight. Through systematic photographic analysis of the sample and the double-sided carbon fiber tape that surrounded the sample in the Type 1 FME, a significant number of detached whiskers were observed and analyzed. Abstract: This experiment, currently aboard Mission 10 to the ISS, is designed to test the germination rates of Soybeans in microgravity. We hope to show the viability of Soybeans as a sustainable dietary addition for astronauts on extended space missions because of their nutritional importance in combating the loss of bone and muscle mass. Our analysis will include a microscopic examination of the seed Coats, Cotyledons, Embryos and the Statocyte cells used by the seeds to orient in gravity. Abstract: Recent research has highlighted the importance of beneficial bacteria in the overall health of the individual. This study will examine antibiotic effects on beneficial bacteria (probiotic) in microgravity and aid our understanding of how to maintain optimal health of future space explorers. Our ground-truth studies have so far shown that antibiotic numbers are lower when Lactobacillus acidophilus is grown in the presence of penicillin compared to no antibiotic. We are awaiting similar samples from microgravity for further analyses. Abstract: This experiment was designed to observe the effects of microgravity on Citrullus lanatus’(Watermelon) germination process. The germination process would begin on day two when the purified water, enhanced with liquid kelp, mix with the soil contents in volume 2. Our team would like to see if the germination rate changes within microgravity. Conditions would be replicated on earth and measured for any differences after the ISS specimen is returned. This experiment will be beneficial for future astronauts and the ISS greenhouse. Advisors: Jacob Cohen, Ph.D., Craig L. Peterson, Ph.D.
Abstract: This experiment was designed to measure the reproduction rate of S. cerevisiae in microgravity compared to reproduction rate of S. cerevisiae on Earth. The S. cerevisiae will be grown for only two days, the smallest increment of time allowed within SSEP experiment parameters. Growth will then be halted using 10% neutral buffered formalin and growth will be compared principally with hemocytometers. Any difference greater than 10% will be considered significant in this experiment. that in microgravity, all of the tails will not regenerate heads due to the lack of gravity. Abstract: Bacteria are a growing threat to the sanitation of the ISS and the health of astronauts. Typical sterilization techniques, such as antibiotics or chemical agents are not ideal for spaceflight due to toxicity to humans or resistance development. Our experiment tests potential use of bacteriophages, viruses that infect bacteria, as a good and effective alternative to conventional sterilization techniques in space. Observed results may lead to the creation of bacteriophages that could target identified bacterial species found on the ISS. Abstract: Long term space travel poses interesting challenges, including growing a long-term food supply. Agriculture in microgravity can be improved by studying mycorrhizae: the mutualist relationship between plants and fungi, because this relationship increases the productivity of agriculturally important plant species on Earth. In a type 3 FME Mini Lab we combine Rhizophagus intraradices, a species of arbuscular mycorrhizae with flax (Linum usitatissimum), and explore the effect of microgravity on the relationship. Any outcome provides valuable information for future space travel. Abstract: This experiment was designed to assess the germination rate of four types of lettuce seeds in microgravity compared to the Earth ground truth. The four types of lettuce seed embedded in gauze growth chamber will start the germination process by the release of water. A fixative will stop the growth five days before the seeds return to Earth. Analysis will include the amount of growth for each variety of seeds. Abstract: This experiment was designed to compare the purity of a crystal grown in a microgravity environment versus an Earth grown crystal. To conduct our experiment, we wanted to use Potassium Sulfate and water. We chose the Potassium Sulfate because it would not have to heated up aboard the ISS. We wanted to see if the crystals would grow at the same rate and if they would have the same basic shape when dealing with the two different environments. Abstract: This experiment is designed to compare the growth rate of eggplant seeds in a microgravity environment versus the growth rate here on Earth. Will a microgravity environment shorten or lengthen the germination time? We will be using four eggplant seeds, gibberellic acid solution to promote growth, and formalin to stop the growth. We believe that the germination will be impacted by a microgravity environment. Abstract: Our experiment was constructed to test if Penicillin could be used as a growth stimulant in seed germination. The sprout growth was measured on Earth over a five day period, and then we compared the average growth of the Raphanus Sativus seeds with and without Penicillin. In microgravity, the seed would grow for five days and then be conglomerated with Formalin. The results of the Earth experiment concluded that Penicillin did not speed up the average growth of the seeds. Abstract: The purpose of our experiment is to find the differences in gravitropism during the germination of radish seeds in gravity and microgravity. Gravitropism is a plant’s response to the stimuli of gravity. In microgravity, we hypothesize that our radish seeds will have longer shoots and shorter roots than those of from control group. This is because the there will be no gravity for the shoot to grow against, and no gravity to for the roots to grow along with. Abstract: This experiment was designed to examine the differences between concrete compression strength when mixed and set in microgravity and concrete compression strength when mixed and set on Earth. 5.54 g Quikrete cement mixture was hydrated with 1 mL Burleson tap water to form concrete in both the flight and ground truth experiments. We will compare voids in the concrete samples from each experiment, and will also test the compression strength of each sample. Abstract: The chytrid frog fungus, Batrachochytrium dendrobatidis, is causing a global decline of amphibians. It was discovered in 1999 but there is no cure. We hypothesized that the life cycle of the chytrid frog fungus cannot be completed in microgravity. If true, then effects of microgravity may be important to help scientists find a cure for the fungus. We have preliminary data from our ground-truth experiments. 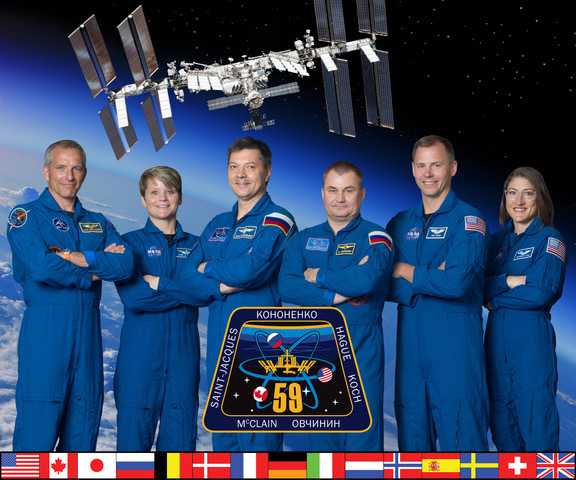 We eagerly await conducting our experiment on board the ISS later this summer.